It's time to go through my neckties and get rid of the ones I don't or shouldn't wear anymore. For the record, I think neckties are ridiculous. I keep wondering how it is possible for our culture's grasp on this silly style to continue to hold fast. Yet the absurd necktie somehow remains as an icon of dignity year after year. Neckties serve no functional purpose. They're just a fashion thing. I consider them banal. But since I am no trend setter and I want to fit in various social settings including church, I acquiesce to wearing neckties as needed. In my closet are two necktie trees with nearly two dozen ties hanging on them. When I go to put a tie on I see many in my collection that I tolerate. I don't particularly like many of them. It's hard to find the right mixture of color and pattern to match the outfit I am wearing, along with the right cloth thickness and texture. Thicker, hardier cloth tends to feel uncomfortable around my neck. 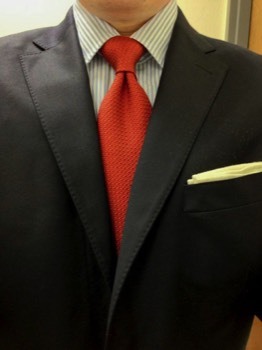 A tie might look great but feel awful or vice versa. My desire to purge my tie collection started on Sunday while we were sitting quietly in sacrament meeting. That morning I had donned a tie that used to belong to my dad. The reddish background emblazoned with nearly indecipherable grayish images of Captain Moroni looked OK with my black suit. But the tie was already a bit worn when I inherited it nine years ago after Dad passed away. I have kept it mostly for sentimental reasons, I guess. As we sat listening to the speaker, I noted that there were a lot of fuzzy little threads sticking out from the bottom hem of the tie. 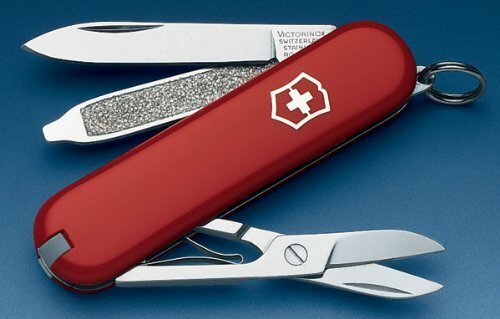 Thinking this was an ideal moment to trim away those errant fibers, I quickly deployed my tiny Swiss Army Knife, the like of which I have carried in my pocket most of my life. Hey, I'm an old Scouter. What do you expect? My initial attempts to trim fine strands met with reluctance from my knife's scissors. Then I remembered having used the scissors to cut the tape on a package, leaving adhesive residue in the pivot point. My wife looked at me askance as I began using my thumb to try to rub away the sticky stuff. Suddenly I felt the blade of the scissors bite into the skin on the pad of my thumb. My wife snickered as I pulled my thumb away to inspect the damage. Not too bad, I thought. It was just in the top layer of the skin. Or so I thought. I looked stupidly at my thumb as I noticed a tinge of bright red blood begin to seep from my self-inflicted wound. Seeing this, my wife worked so hard to stifle a laugh that she snorted at a time that the speaker was striking a serious note. I was so happy to be able to provide some entertainment. Fortunately, I also had a clean square of facial tissue in my jacket pocket. I used this to blot blood while I applied direct pressure to the wound. But after a couple of minutes the thumb was still leaking red fluid. This wouldn't have been a huge problem, except that I was substituting for the ward organist that Sunday. I had maybe 12 minutes before I would have to play the organ. Into my mind flashed the bloody organ keys from The Ghost and Mr. Chicken. My wife leaned over and reminded me that we always carry a first aid kit in the car. I had to leave the meeting and run to the car in search of a band aid. We have long been prepared, but we have used that watertight kit so seldom that I had forgotten how good the quantity and quality of the supplies in the kit were. I quickly applied one of the better band aids I have ever used and returned to the meeting in plenty of time to be ready to play the closing hymn. They wouldn't have to use Bon Ami cleanser to try to remove blood stains from the organ keys. Upon contemplating my cut thumb, I realized that none of this would have happened had I been wearing a necktie that was in good shape. So it's time to go through my necktie collection and get rid of a bunch of them. Except for the ones that have sentimental value, I guess. Can I really chuck the Halloween tie the kids gave me years ago with plastic google eyes glued all over it? My dad taught me years ago that knives should be kept sharp. While I'm pretty good on that score, I have now learned that it's important to keep my pocketknife clean. None of this would have happened had I immediately cleaned away the adhesive residue after I used the knife scissors to open a package. This is an extension of the age old axiom, "A stitch in time saves nine." Meaning that promptly sewing a small hole in fabric may prevent the need to repair a a much larger hole that later develops because the small hole was not properly handled. In essence, if you take care of a small problem now, although it may be inconvenient, it may save you from much bigger problems later. I have also learned that playing with knives during church probably isn't a great idea. My father grew up in Hitler's Germany, being only two years old when Hitler became chancellor. Dad's family lived in a little town up north on the west coast. They were far from the main action so it took longer for the effects of Nazism and Hitler's rule to impact them. Eventually town officials began to be replaced with Nazi Party loyalists. This continued over the years until, according to Dad, everyone from the mayor to the postal carrier and dog catcher was a party loyalist. Quality educators at Dad's school were kicked out and their jobs were given to low-educated Nazis whose "only other qualification was that they knew how to beat the hell out of [the students]." During the dozen or so years prior to becoming chancellor, Hitler allied himself with and then led the Nazi Party. Even back then people knew that the party espoused extremist views, including racism and violence. Yet the rallies Hitler spoke at around the country drew increasingly larger crowds as Hitler blamed the country's problems on Jews, political opponents, rivals, and foreign meddling. Many Germans turned to Hitler because they were desperate. The worldwide great depression hit Germany's rough post-WWI economy particularly hard. "Everyone knew Hitler was a nutcake," said Dad, "but after everyone else had failed at improving the economy, they figured they would give him a chance at it. At least he would then probably shut up after he failed too." But Hitler didn't fail, as far as many Germans were concerned. His approaches may have been unorthodox, but for the first time in a generation many found jobs and began to rise from years of hardscrabble life. Too bad they couldn't see that the improvements they were experiencing were being purchased with a level of horror that the world had never before seen. Many Germans were quite enthusiastic for war. The foreigners who had made their lives hell for 20 years deserved a dose of their own medicine. The soaring rhetoric of German superiority convinced many that foreigners should naturally bow to the German Empire. It wasn't as if countries that were compelled to fight the Axis desired war. But the Germans and their allies made it impossible to refuse. The Nazi Party's strength increased as the economy improved. This came at a cost too. As party loyalty became the coin of the realm, fear of displeasing the party became a factor of everyday life. We have several generations of family history because Grandpa had to prove to the government that he and Grandma had no discernible Jewish blood. Once after insulting a neighbor who was the wife of a low level party officer, Grandma was saved from a jail term by a family friend who was a clerk at the police station. Dad was forced to join the Hitler Youth, a twisted version of Scouting. When giving the Nazi salute became mandatory, Dad said that people would salute friends while saying, "The crap is this deep in Germany." But that kind of joke could only be shared among highly trusted allies because the consequences could be severe. Even in small resort villages party members openly exercised violence on those with whom they disagreed and those they didn't like for arbitrary reasons. Often this was done with official government sanction. Even in small villages families would disappear overnight. Maybe they were Jews or dissidents or some other "enemy of the state." Who knew? One thing was for sure: you couldn't talk about it with anyone for fear of experiencing the same fate. This three-minute video gives a little insight. As the war drew on horrible rumors of atrocities carried out at prison camps trickled back to Dad's village. These tales were so terribly bizarre that they simply could not be believed. Only after the war when the shockingly horrible truth was exposed did people in Dad's neck of the woods realize that the outlandish rumors had been extremely mild. Dad disagreed with armchair moralists who claimed that carpet bombing by Allied Forces in Germany during WWII was immoral. "They didn't live there," Dad would say. "They have no idea how ingrained the ideology had become among the general populace. The Allies didn't just have to defeat the German military; they had to soundly defeat the German people to destroy the ideology. The quickest most compassionate way to accomplish that was through carpet bombing. The reason for WWII was that the seeds of the ideology had not been killed after WWI. If the Allies had not defeated the ideology in WWII, it would have risen again a generation later." Mind you, Dad's village was on the receiving end of that bombing. He suffered PTSD throughout life as a result. But he still insisted that this was the best way forward and that it proved effective. "Two years after the war," he said, "you couldn't find a single person in Germany who would suggest that Nazism had been a good idea." Some estimates put the military and civilian death toll from World War II at around 80 million. Not to mention untold injuries, unparalleled infrastructure devastation, and extensive economic destruction. Those who today idolize Nazism inescapably yoke themselves to this reprehensibly evil legacy. When Dad came to the free USA, he was stunned to find people who, he said, would have happily toiled away at killing people in labor camps for the Fatherland. They didn't use Nazi symbols but they thought along the same lines. We still have people like that in the US today. Freedom of speech in the US means that people in this nation may freely choose to think and speak like Nazis, and to engage in Nazi-like behavior that is peaceful, including waving the deplorable symbol of the Nazi flag. It means that people are free to think and speak like racists, despicable though this may be. Freedom of assembly means that these people are free to peacefully assemble with like-minded individuals. But they are not free to incite or engage in violence or to materially harm others. I do not doubt that many pro-white protesters who were in Charlottesville last weekend feel that they have legitimate concerns that are not being adequately addressed. I'm sure that there are also many like-minded folks who were nowhere near the Charlottesville protests. All these people have a right to say their piece, although, I can't help but feel about their cause as Ulysses S. Grant felt about the Confederacy when he said that their cause was "one of the worst for which a people ever fought...."
Pro-white folks that grouse about scoundrel race baiting "leaders" among minority groups ought to be aware that the race baiter's cloak is just as ugly when worn by those among their own ranks. They should also know that the vast majority of people in this nation who happened to be born with lighter skin pigmentation in no way identify with the pro-white movement and their ilk. When I saw a video clip of one racist saying that white folk need representation based on skin color just as some minority groups have, I said out loud to the computer screen, "You, sir, do not speak for me." To the so-called pro-white folks I say, I am happy to consider your calm and reasoned arguments. But know that I will oppose any Nazi-like or racist sentiments. I will defend your right to harbor those sentiments. But you need to know that I believe such things are unseverably bound to some of the greatest evils ever perpetrated on this earth, and vary from such malignity only by degree, not by kind. I love you; but I am compelled to hate some of your ideals. I also say that there is a better and happier way forward that is found in the true gospel of Jesus Christ and in Jesus' teaching to love each person as a child of God who has infinite value, regardless of skin color, economic status, nationality, belief, or any other seeming division point. I invite you to put down your anger and hatred and come to the fount of joy. A few years ago after I got a new phone, I kept getting hit up with messages prompting me to turn on a new feature called Google Now. I tried it for a little while, but it seemed mostly like one of those gee whiz features that isn't really very useful. So I turned it off. A few months later after repeated pestering I turned Google Now on again. Improvements had been made and it at least seemed marginally useful. So I kept it around. Over time the app learned to present more of what I wanted to see and less of what I didn't care about. I kept thinking that I'd turn the app off, but then I found myself using it more and more. Features seemed to improve over time as well. A notification would pop up when a it found a significant number of new stories that might interest me. I usually only was notified once or twice each day. If I didn't want to look at the cards right then I could simply swipe the notification away. It was easy to swipe away cards I had finished with or that didn't interest me at the moment. My feed usually only presented about dozen or so cards at a time, so it was manageable. Tapping on a card took me to an article. When I was done with the article I could hit return and go back to the same point I was at in the feed before going to the story. The feed was informed by my Google search patterns, which reflect my software development career. So I was regularly presented with interesting tidbits for which I didn't specifically search but that were both intriguing and useful on the job. The feed was relatively unobtrusive. It didn't demand much of me but it was there when I wanted to use it. It seems that Google intended users to go to Google Now instead of social media apps as their main news interface. At least, I seemed to be going that direction. Until a few months ago when the app started to become less useful for me. First my app notification went away. Then it was replaced by a notification that looked very similar but that took me to a feed that was entirely about weather. I have a weather widget on my phone's main screen and I can look outside at the weather anytime I want. A whole feed about weather seemed pretty useless to me. I tried many different setting changes but nothing helped. My news feed was still available but only by tapping on the Google app search bar. And then the news cards were obscured by the keyboard. While it's not too difficult to escape out of the keyboard, it seemed noisome and unnecessary when I wanted to see my feed. Then another problem surfaced. I could still peruse the cards in my news feed and I could tap on a card to go to the actual story. But any attempt to return from the story completely closed the app and dumped me back on the phone main screen. If I wanted to get back to my feed I'd have to once again tap on the Google app search bar and dismiss the keyboard. On July 19 Google released an upgraded Google app that included the feed. There was a lot of hype touting this as brand new and saying that Google Now was going away (See The Verge article for example). But it really wasn't brand new. It looked pretty much like the feed had looked in Google Now. Still, there were supposed to be improvements. That had to be good, right? Not so much for me. After the app upgrade I could no longer swipe away cards from my feed. To get rid of a card I had to tap on the three dot icon in the upper right corner of the card and select "Done with this card" from the drop down menu. I tried various solutions — including uninstalling updates, clearing cache, disabling/re-enabling, and a variety of more obscure approaches — but none of them worked. The problems even persisted with a new phone. That's when I cried uncle. If Google's goal was to get people to shut off their Google app feed altogether, their methodology was effective for me. True, they had to wear me down over a period of half a year. But they finally got me. I'm done with Google feed on my phone. I would say that I don't miss the feed, but that's not accurate. It is true that I used the feed decreasingly as it became less convenient, so that turning it off wasn't that big of a step. Still, I have a dandy phone and I think it ought to do some of the same cool things its predecessor did well for several years. So I miss the feed. I liked a lot of things about it when it worked well. What I really don't miss is all of the problems my Google feed developed over the past half year. So it's with a somewhat heavy heart that I say, "So long, Google feed. Thanks for the good times."